The interview is one of the most crucial moments of the job search experience and your chance to show your potential employer that you have what it takes to succeed in the position. In order to do that in today's highly competitive job search environment, though, you'll have to find a way to stand out from the crowd. Using his twenty-five years of experience, New York Times bestselling author Martin Yate has established a set of rules for job interviews that is sure to get you noticed. Instead of memorizing canned answers, Yate provides you with an explanation of the thought behind more than 300 questions and answers, so that you'll always know what the interviewer is really asking and how you should respond. Packed with information on handling stress questions and weird interview venues, this book also teaches you how to keep your cool--and confidence--from the moment you step inside the building. With Knock 'em Dead Job Interview, you will finally be able to differentiate yourself from the competition and score the job! Martin Yate, CPC, is one of the foremost experts in the field of job search and career management. 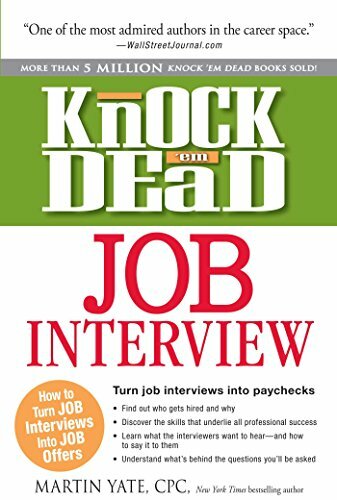 The author of Knock 'em Dead Resumes, Knock 'em Dead Cover Letters, Knock 'em Dead: Secrets & Strategies for Success in an Uncertain World, and numerous other books, he has helped millions of people turn their careers and their lives around. He currently lives in Savannah, GA.